Forget a dash of tonic with lemon and lime - gin has been spiriting its way into our mealtimes, with supermarkets now selling gin-flavoured foods, from yoghurt to fish. So does gin belong in the pantry as well as the pub? Tubs of gin-flavoured yoghurt - containing 0.25% alcohol - went on sale in Sainsbury's this summer, which says more gin foods are on their way. Meanwhile, gin-infused salmon, gin-flavoured popcorn and sweets, gin and tonic ice cream and gin sauces are stocking supermarket shelves across the UK. Gin's resurgence in liquid form has been dubbed a "Ginaissance", with sales of the spirit surpassing £1bn last year and micro-distilleries opening across the UK. "Sure, there's an element of gimmickry, but why not?" says cocktail expert and writer Ben Reed, who has 20 years' bartending experience. It is an "obvious step" for chefs to use gin, he says, adding it can enhance flavours in foods. "By choosing gins with the appropriate botanical additions you can add complex combinations," he says. Gin's trendy reputation is now a far cry from the spirit's age-old nickname as "Mother's ruin" - a favourite vice drink of the poor, and thought to bring on a miscarriage if consumed while in a hot bath. Supermarkets are confident people will tuck into gin-flavoured food as gin's rise continues. Nicola Bramley, a food development chef at Sainsbury's, says the supermarket's premium gin sales are rising 25% year-on-year, and insists the trend "isn't limited to your glass of G&T". "There's plenty more to come," she says, adding that the retailer has plans to introduce a smoked salmon paté with a gin & tonic glaze. Gin, like other spirits such as vodka, has a neutral flavour but gets its character from botanicals used to flavour it - the taste we think of as "gin" comes from juniper, which tastes like pine. Miles Beale, chief executive of the Wine and Spirits Trade Association (WSTA) says our love of gin means flavoured food is "selling like hot cakes". He says the "quintessentially British" drink is supporting a wider industry, with gin-themed gifts and gin-flavoured foods. "It is fantastic to see," he adds. It is now commonplace to see flavoured gins from seaweed to tea - but some think using the spirit in snacks is a step too far. "Gin with yoghurt or gin-flavoured crisps don't seem like natural bedfellows to me," says Barney Desmazery, a chef and BBC Good Food magazine's editor-at-large. 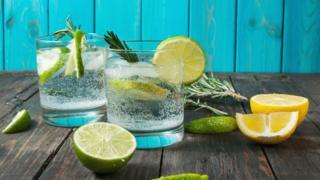 He says food manufacturers are jumping on gin's resurgence to make their products seem more enticing, rather than matching the right flavours. "It's without doubt got a place in the kitchen," Barney says, instead suggesting gin fans experiment with homemade treats, such as a gin and tonic cake. He recommends the spirit's alcoholic flavour be "used sensitively". And Nick King, a spirits teacher at the Wine and Spirit Education Trust, says "you'd have to be some kind of god-like taster" to detect gin flavours in many of these foods. "They're not necessarily very strongly flavoured - not least because if it's in the yoghurt aisle and it's notably alcoholic, there might be confusion at the till," he says. He says alcohol-flavoured food is nothing new. "You've had rum and raisin ice cream for donkeys years, liquor chocolates - and of course my mother's legendary brandy butter." But he admits the products tap into a booming gin market - mainly comprising people in their 20s and 30s - who like anything quirky. "As an idea, it makes perfect sense in cashing in on and appealing to those people," he says. "We're looking at a generation that's much more interested in flavour and interesting and exciting things." He adds: "Gin will be around when our grandchildren are talking about it, but whether gin ice cream will be is another thing altogether."